Winter is upon us and judging by the low temperatures and heavy snow it is likely to remain cold until spring relieves us with some much-needed warmer weather. During the cold winter months, facility managers sometimes struggle to keep their buildings warm without running up the electric bill, so much so that some choose to convert electric to gas. To help you avoid the high costs of heating, here are a few simple tips on how to Lower heating costs and, in general, reduce operating costs during cold weather. Make sure you are up to date on any and all repairs your heating system may require. For professional help with this you can contact a plumber such as Schuelke Plumbing to carry out a thorough check. If you’re interested in this company take a look at their reviews here schuelke plumbing reviews. Routine maintenance will make sure that your heating equipment can withstand any extreme changes in temperature. Finding a reliable HVAC repair company such as Rapid Repair Experts hvac raleigh should make it easier for you to get peace of mind when the harsh Winter comes around. To ensure reduced energy use, have the water heater set to the lowest useful temperature. This will avoid using excess energy that makes the water too hot. This will help regulate water usage. Monitor your building’s temperature changes. Find the right temperature for your building and invest in automated controls. Let sensors determine when its “too cold” instead of the guy that’s always freezing. This will help avoid costly temperature fluctuations as well. It seems pretty obvious, but be sure to keep any building openings closed if you plan on using a heating system to regulate the facility’s temperature. The same goes for doors, open ducts, wall louvers, and ventilators. Preventing cold air from entering will ensure your thermostat is reading the interior correctly and not expending energy on unnecessary heating. For Natural Ventilation systems where you have process heat generation to aid in heating your building, make sure you keep your dampers closed. Even in the middle of winter, you may find some days when the sun’s natural heat will help with keeping your facility warm. We suggest to utilize Daylighting devices to make sure you’re fully taking advantage of sunlight. Use this time to lower the heat, and save on energy, only needing the temperature to go back up after the sun has set. People choose Moffitt because our ventilation systems work. 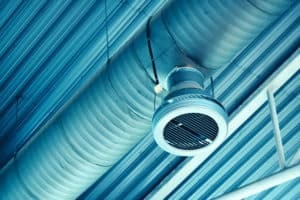 If your building is lacking proper ventilation, then it’s time you invested in an old concept with superior technology. Moffitt is one of the most trusted names in Ventilation and Louvers. If you would like to learn more about our products and services, contact us today!